Product #20664 | SKU 023600-0001-110 | 0.0 (no ratings yet) Thanks for your rating! 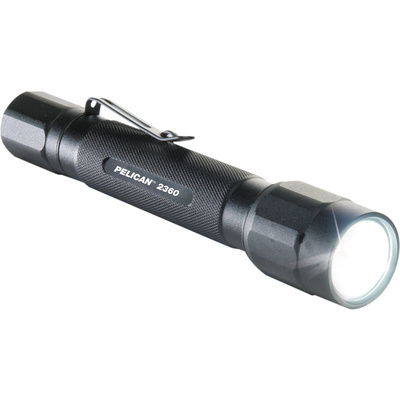 If you like the convenience of AA alkaline batteries, but need the performance of lithium batteries, the Pelican 2360 LED Flashlight is the light for you. Using 2 standard AA alkaline batteries, the new 2360 LED emits a peak output of 375 lumens. The 2360 includes 3 modes – High / Strobe / Low and allows the user to select from 4 selectable programs. With the included 29 lumen low beam a run time of up to 13 hours will support close up use and any extended time needs. A strobe mode is also included for tactical or signaling purposes. The built-in battery level indicator ensures you will not be left in the dark.